When a job requires you to reach great heights, you need an articulating boom lift. 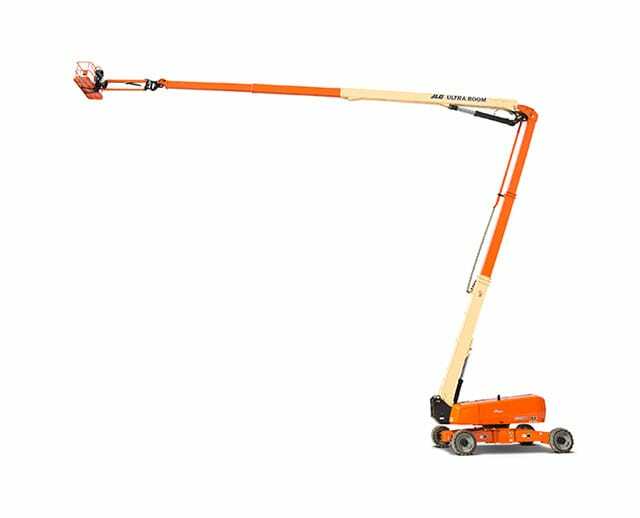 These machines feature aerial work platforms and have two or more boom sections that hinge. The lifts allow you to easily tackle all types of tasks. Since these lifts are small, they'll fit almost anywhere, and they can reach over obstacles. Find out how an articulating boom lift works, learn key safety tips, and discover why you need one of these machines for your next job. 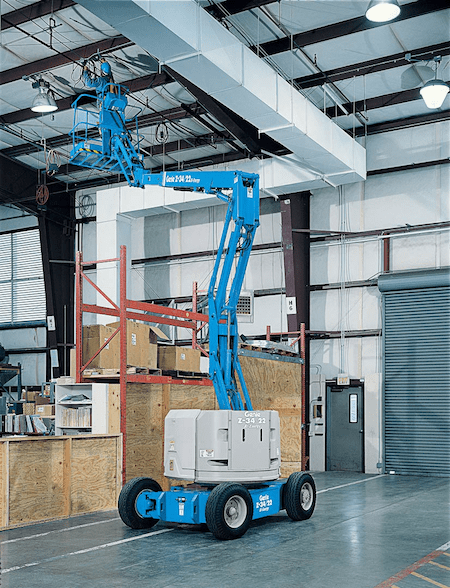 What Is an Articulating Boom Lift? Articulating boom lifts allow for up-and-over functionality. Articulating boom lifts go by a few different names. Some manufacturers call them “articulating booms” or “up-and-over booms.” Likewise, some contractors call them “cherry pickers” or “knuckle booms.” No matter what you call them, these versatile machines get the job done. 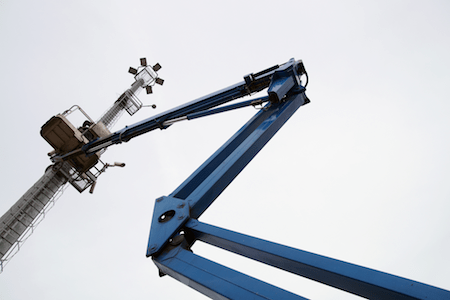 Articulating booms are aerial lifts that rely on hydraulics to move up and down. While they come in different sizes, all models have great reach capabilities. They can lift workers dozens of feet in the air. Thanks to their hinges, or articulations, they can extend over walls, wires, and other barriers. Many models come with a jib, which makes accessing distant heights easier. This projecting arm gives the platform up to an extra 6 feet of reach so that you don't have to move the lift every time you need to change positions slightly. Since all models feature wheels, these lifts can also move forward, backward, and side to side. Many articulating booms have a tight turning radius. This feature allows them to change directions and turn around easily, even in limited spaces. The tight turning radius also allows for more exact movements, which is helpful for navigating around tree branches or power lines. These jib lifts can run on gas or diesel (also called dual fuel), or electricity, and you can easily find a model that works for your job site. The articulating boom lifts of today are relatively advanced. However, these machines have come a long way since they first entered the construction scene. The first boom lifts date to 1951, when inventor Walter E. Thornton-Trump used his boom lift to pick fruit in his orchard. Thornton-Trump patented his invention in 1952, and boom lifts quickly took off. These machines became popular with firefighters and utility workers, all of whom need to reach heights safely. 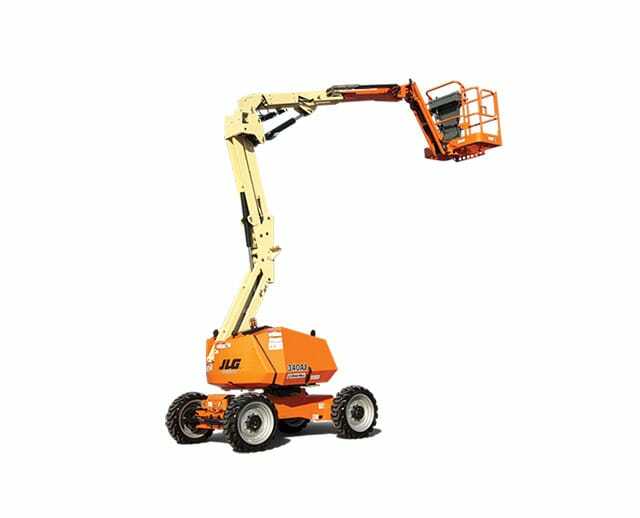 Today, you can find boom lifts with a range of capacities, sizes, and features. Articulating boom lifts offer a list of benefits. Depending on where and how you need to use one of these machines, you can easily find one that works for you. Many construction sites feature confined workspaces that can make your job tough. When larger machines won't fit and ladders don't reach high enough, boom lifts offer the ideal solution. 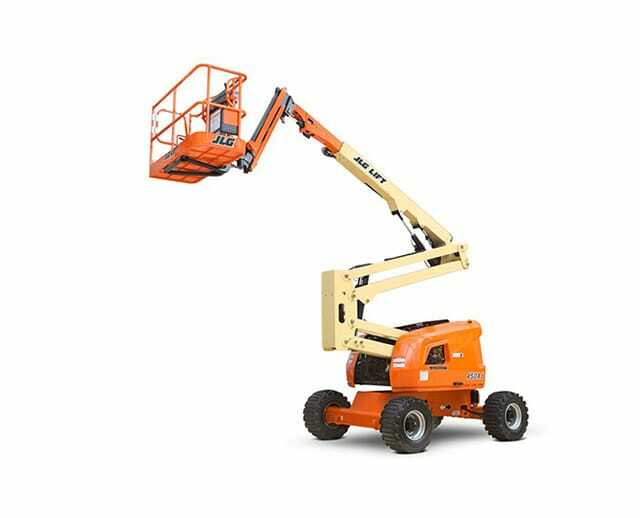 For limited spaces and a tight turning radius, look for smaller articulating boom lifts. 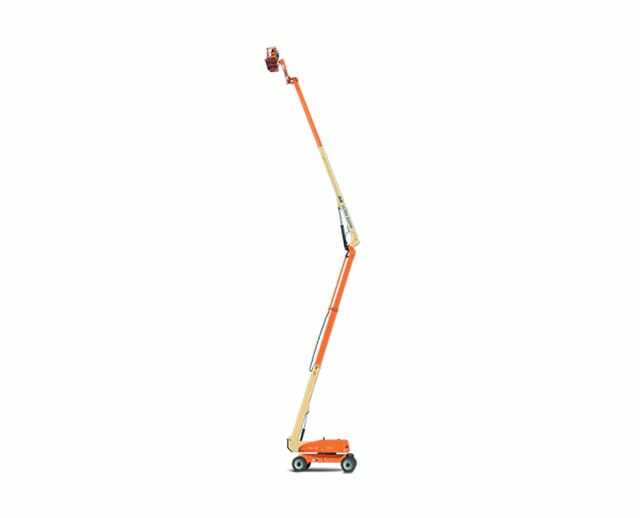 These machines can't reach as high as some larger models, but they can reach heights of several dozen feet in confined areas. When the job demands height but also presents many obstacles, a standard aerial lift can't always do the job. For example, some contractors think about using telescopic boom lifts for added height. However, these lifts can only lift work platforms upward in a straight line. In contrast, articulating boom lifts can lift workers up, over, and above barriers. Ultimately, these boom lifts give contractors more navigation options and added features over standard lifts. One of the largest benefits of articulating boom lifts is that many offer a little extra reach. Look for models that have a jib boom extension. This feature gives the lift one extra hinge to let it move up, down, or sideways a few extra feet. A jib can help your crew save time since it allows for slight movements without having to reposition the lift completely. No matter where you need to get added working height, you can find an articulating boom lift to do the job. Many models are designed for working indoors. If you plan to use your boom lift inside, look for one equipped with non-marking tires. This feature ensures that you can get the job done without damaging the surface of the floor. For indoor use, also be sure to choose a model that runs on electricity or hybrid fuel that won't release fumes. Need an articulating boom lift for an outdoor job instead? Look for a model with four-wheel drive and enhanced traction to tackle many types of surfaces. For outdoor use, you'll want an articulating boom lift that uses a gas or a diesel engine for optimal performance. You can also find models with added features for safe use on uneven ground. Look for boom lifts made for rough terrain, especially if your crew needs to navigate steep grades or rocky ground. 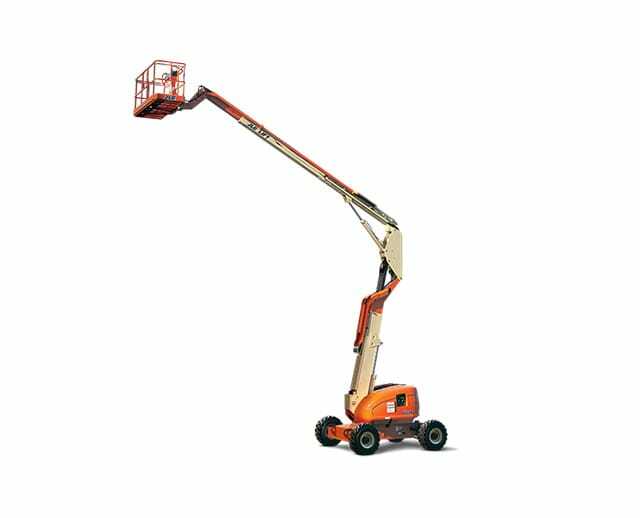 Articulating boom lifts can reach staggering heights (such as lighting and telecom towers), even within tight spaces. Perhaps the largest benefit of articulating boom lifts is that these machines can do countless jobs on a construction site. Since they're good for more than one task only, you can get your money's worth when you rent a boom lift. Whether you're building a single-story residential home or a multi-story commercial structure, construction jobs require height. Articulating boom lifts give you the power to access tough-to-reach spots from the ground up. Since boom lifts feature work platforms, they can help your crew move materials, supplies, and equipment, too. Space is at a premium on many construction sites. 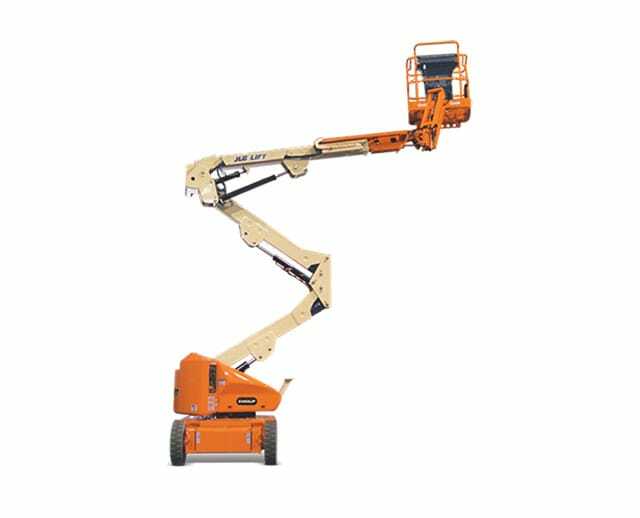 When you need to access heights in a restricted space without running into tail swing, articulating boom lifts are up to the task. Check the turn radius before you rent to confirm that your lift of choice can fit in the space and do the job you need. Installing key components of a structure can be challenging if you can't reach the area safely. 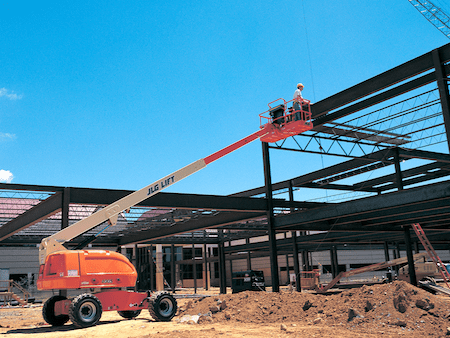 Fortunately, articulating boom lifts are ideal for installing struts and erecting steel frames. These machines work especially well when you need added height or extra horizontal reach to do the job. The last items on your job site to-do list are often the toughest to tackle, especially when you need to get around obstacles or deal with challenging surfaces. 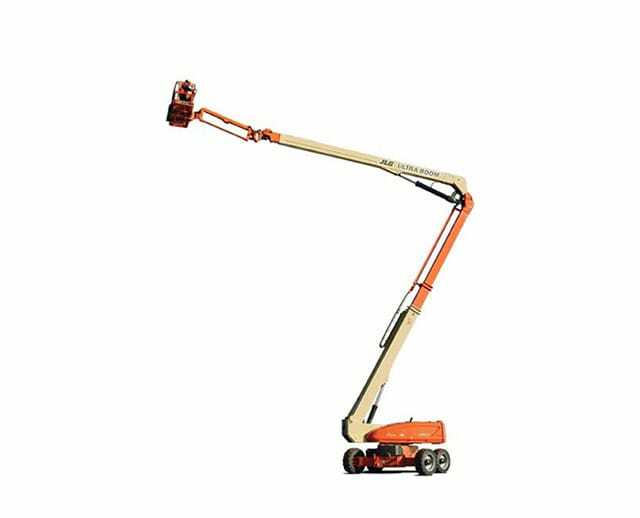 Boom lifts are ideal for electrical work and maintenance, as they can lift your crew up and over beams, walls, and wires. These lifts also work well for cleaning, window washing, and painting, no matter whether you're tackling the interior or the exterior. Look for models with non-marking tires for interior work and rough terrain tires for exterior jobs. While you're outdoors, you can also use articulating boom lifts for tree trimming. Since these machines can easily move workers up and over limbs, they're ideal for tackling trimming and pruning safely. Platform Height: Lift platforms can reach from 30 to 150 feet high. As a general rule, lifts with a larger footprint offer more reach. Platform Capacity: Lift platforms can support between 500 and 1,000 pounds. Few lifts can support larger loads. Horizontal Outreach: Articulating boom lifts can extend out between 20 and 65 feet. Make sure your lift offers enough horizontal reach. 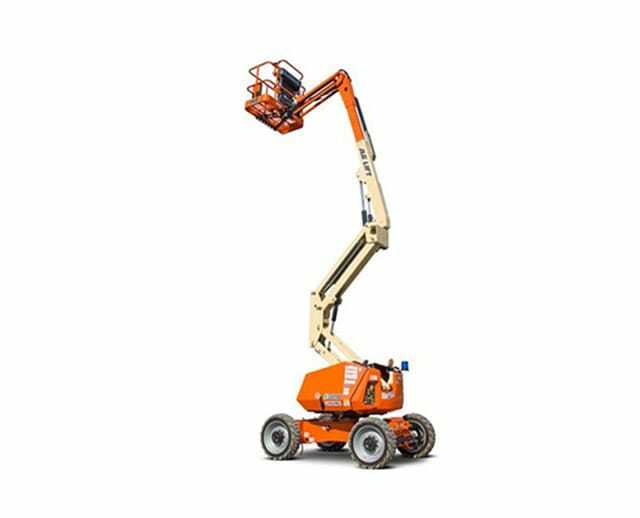 Machine Height: Boom lifts are typically between 6 and 10 feet tall. For indoor use, make sure your lift fits through doorways and interior openings. Machine Width: Many boom lifts measure between 6 and 8 1/2 feet wide. If you plan to use a lift indoors, make sure the space has adequate clearance. Machine Weight: Many models weigh between 5 and 30 tons. Always confirm that your job site can support the weight of the machine. Genie: Since 1985, Genie has offered some of the most innovative and reliable lifts. This brand's articulating Z-boom has “up-and-over” capabilities and comes in more than a dozen models. Haulotte: Whether you need a small or large articulating boom lift, Haulotte has you covered. Haulotte models offer platform heights from 33 to 130 feet and come with a range of chassis sizes. 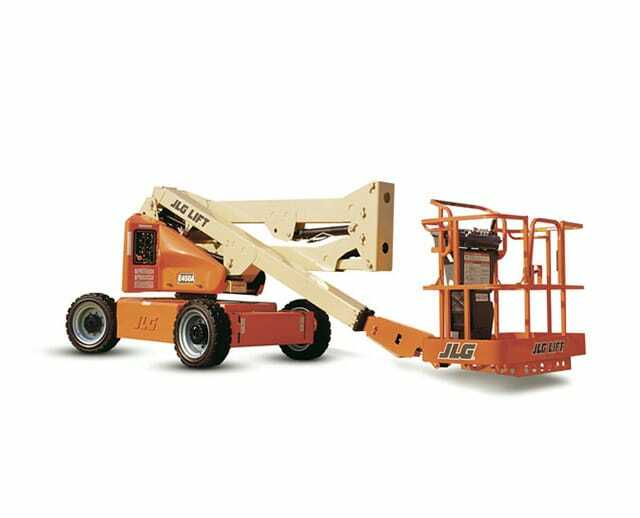 JLG: From indoor machines to rough-terrain models, JLG offers about a half-dozen boom lifts. Look for fast-moving models and options like the Soft Touch platform to get more out of these lifts. 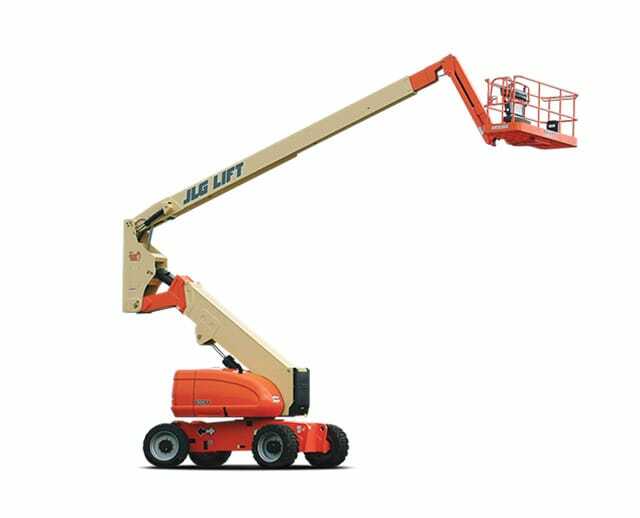 Niftylift: This brand has more than a dozen boom lift models in a range of sizes, reach capacities, and fuel types. Niftylift also offers safety features such as ToughCages and hybrid fuel options. Snorkel: This brand produces three boom lift models to meet all your needs. Each comes with several package options for use indoors, in extreme weather, or with multiple fuel types. Articulating boom lifts can help your crew tackle tough jobs safely and easily. Before you use this type of equipment, you need to know how to operate it safely. Like other heavy-duty machines, boom lifts require training. 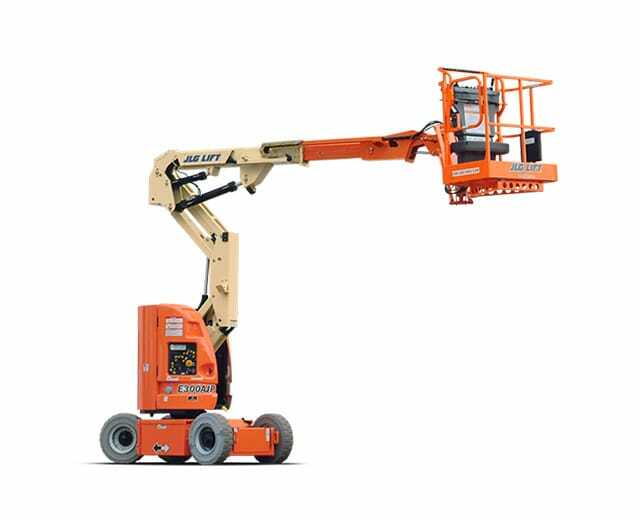 All crew members who plan to operate the boom lift should complete training. Training: BigRentz offers training courses to get your crew familiar with safe boom lift operation. These courses include online classes and videos. They also feature hands-on training and an exam. After finishing the training, your crew members will receive a certificate. OSHA Practices: Your team should also review the Occupational Safety and Health Administration (OSHA) safety tips. These work practices are standard for contractors. Operator Manuals: It doesn't matter how many times you've used a boom lift. You should always review manufacturer instructions before using a new machine since each model is different. Reading the manual will alert you to the controls and features of your current model. Inspections: Your crew should always inspect equipment before using it. If you notice a safety or repair issue, call your BigRentz Rental Expert right away. Safety Features: Always use a body harness on an elevated platform. Never override or disable the machine's safety features. If any of the safety devices prevent you from using the machine the way you want, consider renting a different model instead. Load Limits: Never exceed the load limit for the boom lift. Take care to add up the weight of workers, equipment, and supplies on the platform. Check the load limit before renting to make sure the boom lift will do the job. Inclines: Never use a boom lift on an incline without applying the brakes. Use wheel chocks for added safety. Protective Gear: To keep your crew members safe, always encourage them to wear protective gear. Depending on the job, they may need to wear hard hats, safety shoes, or high-visibility clothing. Electrical Wires: When working near overhead wires, your team should always keep a safe distance. As a general rule, stay at least 10 feet away from power lines. Even if they appear to be inactive, always treat overhead wires as if they're live. It is extremely important to follow saftey protocol when operating an articulatingboom lift. 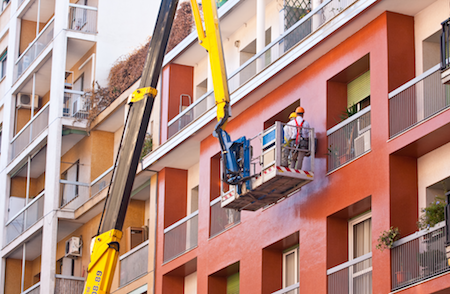 As you get ready to use your rented articulating boom lift, you should also make sure your crew knows about common hazards. Understanding the dangers that your crew members could encounter will help them stay safe. Since many boom lifts can reach up to 150 feet in the air, falls can happen. Your crew members can prevent falls by always standing firmly on the work platform. They should never sit or stand on the safety rails. They should refrain from using ladders or scaffolding on the platform. When elevated, make sure your crew members always wear a body harness. Ensure the harness is tethered to the lift for added protection. If your job site features overhead wires or other electrical equipment, your crew may come into contact with these dangerous objects. To stay safe, your crew should always assume that wires and equipment are live. Instruct your crew to maintain a safe distance of 10 feet from all wires and conductors. If a gas leak happens on your job site, evacuate your crew right away and don't use a boom lift in the area. Although electrical wires pose serious dangers, articulating boom lifts can run into many obstacles. When operating a boom lift, make sure your crew members can see in every direction. Make every attempt to avoid obstacles such as tree limbs, walls, and barriers. While electric and hybrid boom lifts don't produce fumes, gas-powered models do. If you're working in an indoor space or a confined area, note that fumes may not ventilate properly. Poor ventilation can make your crew sick and could make them unable to operate the lift correctly. Always use equipment designed for the space, and don't use fume-producing lifts indoors. Why Rent an Articulating Boom Lift From BigRentz? Along with choosing the right type of articulating boom lift for your job site, you'll need to decide whether you should rent or buy. At BigRentz, the choice is clear. Find out some of the biggest benefits of renting equipment and learn why you should choose BigRentz. For many contractors, the decision comes down to cost. In many cases, renting equipment is more affordable than buying it. After all, buying new equipment requires a major capital spend. The average price for a new boom lift is between $75,000 and $100,000. If you don't have that type of capital available, you may have to take out a loan. That loan can cost you more in interest charges, and a loan ties up your company's available credit. In contrast, renting an articulating boom lift costs only a few hundred dollars a day or a few thousand dollars per month. Whether you need to use the lift for a day, a week, or for a few months, renting offers substantial savings. Some contractors consider purchasing used equipment to save money. While that choice can save you money initially, you'll end up with an older model that doesn't have the latest technology. Relying on older tech can make jobs take longer, which can cost you money. When you want the newest features, but you want to keep your project costs low, renting can be your best bet. You can easily forget that the price tag on the machine is far from the only costs you'll pay if you own a boom lift. Storage alone can cost you hundreds of dollars every month, especially if you aren't actively using the lift. Maintenance and repairs can add up when you use the lift constantly. When you own equipment, you'll also have to pay insurance and transportation costs every time you need to move the lift. When you rent, all of these factors are included in the cost of the rental. From maintenance to delivery, BigRentz handles it all to make renting an articulating boom lift more affordable and more convenient. Articulating boom lifts come in all shapes and sizes. You may not always easily find the model you need in your area, but BigRentz always has what you want available for rent. With more than 7,500 local delivery locations, BigRentz is ready to help. From smaller indoor boom lifts to outdoor models equipped for rough terrain, BigRentz has what you need. In many cases, you won't have to wait long for delivery either. BigRentz offers next-day or same-day delivery for most equipment. As a result, you can get to work right away without waiting weeks or months for delivery. If your project plan is subject to change quickly, you can rest assured that you'll always have an articulating boom lift when and where you need it. As you prepare to rent an articulating boom lift, you're bound to have at least a few questions. Explore some of our most frequently asked questions to get all the information you need. 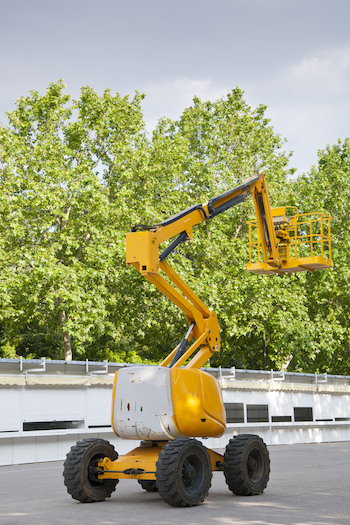 How long can I rent an articulating boom lift? At BigRentz, we offer rental time frames that work for you and your crew. Rentals start at one day, which includes a single eight-hour shift, and go up to one month, which includes 20 eight-hour shifts during a 28-day period. We also offer one-week rentals, which includes five eight-hour shifts during a seven-day period. Choose the length that works for you, and we'll arrange the delivery. Can my crew pick up or drop off the boom lift? No, BigRentz handles all equipment pickups and deliveries. Our insurance coverage requires us to take care of all transportation. We aim to make all deliveries easy and convenient for your crew. Can I get a delivery tomorrow? Yes, BigRentz usually offers next-day rentals and deliveries. In some cases, BigRentz can deliver on the same day. Your local area and the model you're renting may affect availability. Ask your BigRentz Rental Expert to confirm whether the boom lift you need is available for the next day. Can I extend the rental term? Yes, it's usually possible to rent equipment for longer than you'd planned. Call your BigRentz Rental Expert at least four hours before your rental term ends to ask for an extension. Is fuel included in the rental? No, renters are responsible for fuel costs. You'll receive the equipment with a full fuel tank. You'll need to refill the tank before the rental ends. Am I responsible for damages? Yes, renters are typically liable for any damage to equipment. However, the damage waiver covers some standard wear and tear. Take the time to review the damage waiver and rental terms to make sure you're clear. With the many jobs they do and the many benefits they offer, it's no wonder articulating boom lifts are essential for contractors. Whether you need added height or extra reach, these heavy-duty machines are up to the task. Why wait to get the job done? Call BigRentz at (888) 325-5172 today. Rent the right articulating boom lift for your job site and arrange delivery on a schedule that works for your crew.